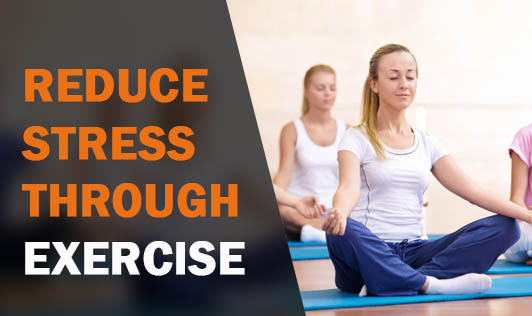 By indulging in exercise and general activity, you can increase your resistance to external stressors. Exercise beats stress in two ways. One, it helps to elevate heart rate which in turn reverses the damage caused to the brain by stress. And two, it promotes the production of neurohormones such as norepinephrine that is linked to cognitive learning and mood switching. Release- It acts as a release for tension and anxiety and, in many respects, substitutes for the fight-or-flight mechanism. Relaxation- It can provide a sedative effect caused through Endorphins that are obtained through natural physical movement. Increases Energy & Fatigue Tolerance- A major effect of stress is that it uses up energy and makes you feel worn out. Exercise on the other hand helps to maintain your energy and heighten your tolerance for stress. Muscle Health- Exercise aids in maintaining muscle elasticity and minimizes the muscle-shortening effect caused by inactivity. Increase Physiological Control- That “tones” up the body’s stress reaction (adrenal glands) by helping to stabilize heart rate and blood pressure, and promoting muscle tension. Increases Emotional Well-Being- Fit individuals who exercise regularly tend to be more relaxed and less anxious or depressed. In fact, one study found that exercise was significantly more effective than tranquilizers for reducing anxiety associated with prolonged stress. Perhaps one of the most interesting facts about exercise is that it alters the perception of stress. So next time you’re feeling a little blue, get up, get moving, and have some fun.